In this post we are going to discuss primary well control. Generally we drill under overbalance condition. 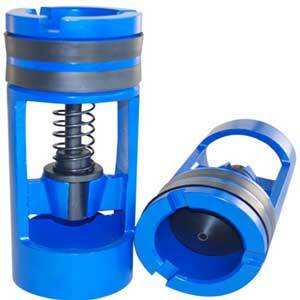 Overbalance means borehole pressure is higher than formation. Typically as formation pressure increases, drilling fluid density is increased with barite to balance the formation pressure. This keeps formation fluids from entering into the wellbore and prevents pressured formation fluids from causing a blowout. The pressure exerted by the drilling fluid column while static is called hydro-static pressure and is a function of the density and true vertical depth(TVD) of the mud. Keeping the hole under overbalance condition means that no formation fluid will enter into the wellbore. 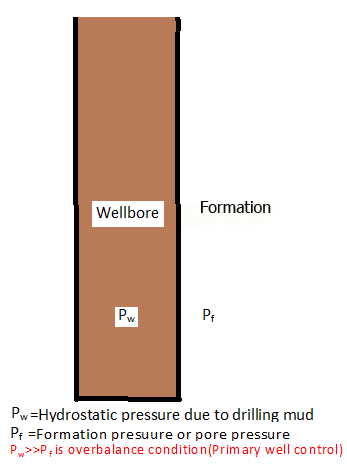 If the wellbore pressure falls below the formation pressure , formation fluid will enter into the well-bore (Kick) and if this influx of fluid flows to the surface uncontrollably it is called blowout. Blowout are generally catastrophic and can cost many lives. That’s why keeping the hydro-static, pressure due to drilling mud, above the formation pressure is referred as Primary well control. If primary well control fails and kick takes place then the blow out preventer (BOP) are closed which are referred as secondary well control.